Eugene Wesley "Gene" Roddenberry was an American television screenwriter and producer. He is best remembered for creating the original Star Trek television series. Born in El Paso, Texas, Roddenberry grew up in Los Angeles, where his father was a police officer. Roddenberry flew eighty-nine combat missions in the Army Air Forces during World War II, and worked as a commercial pilot after the war. Later he followed in his father's footsteps and joined the Los Angeles Police Department where he also began to write scripts for television. 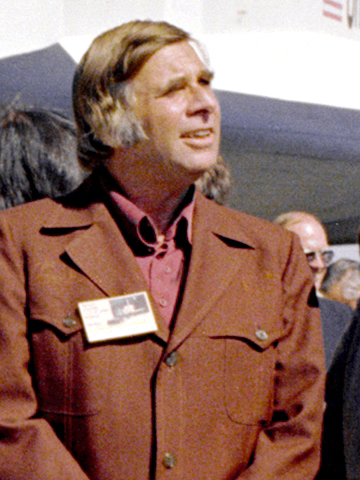 Eugene Wesley "Gene" Roddenberry (August 19, 1921 – October 24, 1991) was an American television screenwriter and producer. He is best remembered for creating the original Star Trek television series. Born in El Paso, Texas, Roddenberry grew up in Los Angeles, where his father was a police officer. Roddenberry flew eighty-nine combat missions in the Army Air Forces during World War II, and worked as a commercial pilot after the war. Later he followed in his father's footsteps and joined the Los Angeles Police Department where he also began to write scripts for television. As a freelance writer, Roddenberry wrote scripts for Highway Patrol, Have Gun–Will Travel, and other series, before creating and producing his own television series The Lieutenant. In 1964, Roddenberry created Star Trek, which premiered in 1966 and ran for three seasons before being canceled. He then worked on other projects including a string of failed television pilots. The syndication of Star Trek led to its growing popularity; this in turn resulted in the Star Trek feature films, which Roddenberry continued to produce and consult. In 1987, the sequel series Star Trek: The Next Generation began airing on television in first-run syndication; Roddenberry was heavily involved in the initial development of the series, but took a less active role after the first season due to ill health. He continued to consult on the series until his death in 1991. In 1985, he became the first TV writer with a star on the Hollywood Walk of Fame and he was later inducted by both the Science Fiction Hall of Fame and the Academy of Television Arts & Sciences Hall of Fame. Years after his death, Roddenberry was one of the first humans to have his ashes carried into earth orbit. The popularity of the Star Trek universe and films has inspired films, books, comic books, video games, and fan films set in the Star Trek universe. "The Cage" - Star Trek Original Pilot - Gene Roddenberry Intro! From the DVD of the color version of "The Cage" (the original 1965 Star Trek pilot), here is some rare footage with the late Gene Roddenberry! Who Betrayed Gene Roddenberry? The Studio or Star Trek Fans? Did Star Trek Discovery Betray The Vision of Gene Roddenberry ?